Equipped with: Three ceramic pistons, brass linear pump head with built-in by-pass valve. By-pass thermal protection with safety valve. Electrical start with full engine control functions. Auxiliary belt driven alternator sturdy. Lombardini 15LD440 diesel engine (air cooled). Pump-motor gearbox (1,650 RPM). Automatic engine RPM regulator. Integrated detergent suction with external suction probe. 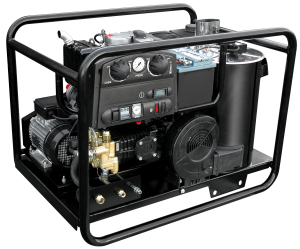 Electrical start with engine contrl functions. Unique tank for diesel engine and burner. Battery included.